Who's That? MemRec Knows Every Member -- And So Can You! Living in DC, we see politicians out and about all the time, but with so many around it can be a challenge to put names and faces together. Not anymore! Years ago when I was an intern for the House Democratic Caucus, we were required to use an internal program developed for the Capitol Police called MemRec to memorize the entire Caucus because we had to know who to let into meetings at a glance. Ever since that internship I have been slowly losing track of the current membership of the House and Senate, yearning for access to that great tool again. Are you a Federal Worker? Here's an app for you! Today I extended Cloakroom access to 260 new geofences around federal buildings and 309 .GOV email domains. Now federal workers from 474 agencies and subagencies can use Cloakroom to anonymously share tips and intel with their colleagues and chat one-on-one with end-to-end encryption. A couple weeks ago I thought I hit gold while browsing the USA.gov APIs. 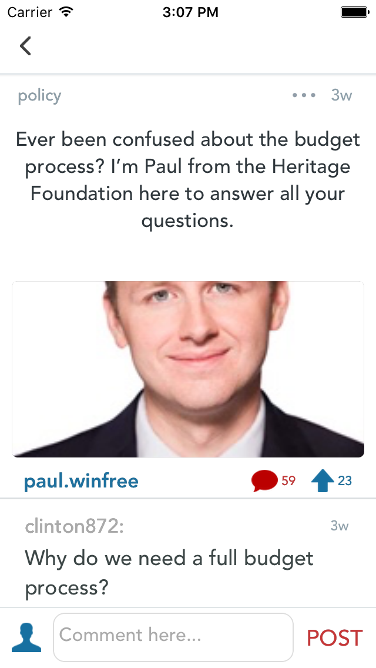 I had just been reading about EPA employees turning to encryption apps like Signal and State Department employees “dissent channel” letters to thwart Trump, so when I found the Federal Agency Directory API I got excited about extending Cloakroom’s anonymous chat functionality, which House and Senate staffers have been using for nearly two years, to facilitate so-call dissent channels across the federal government. At its heart, Cloakroom is a civic data app. Our goal has been to combine social networking with legislative data to promote bipartisan policy discussions and to help each other get work done. 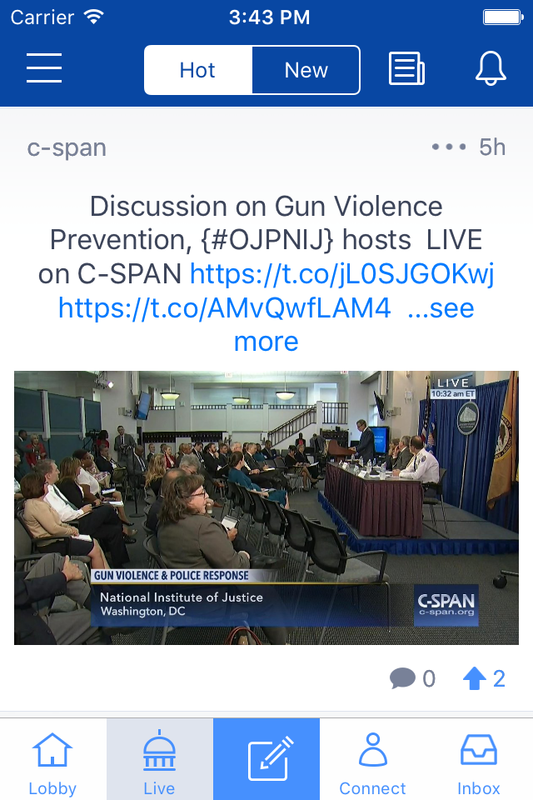 The latest Cloakroom iOS update introduces a stream of news, polls, legislative data, and live congressional video tailored to your professional interests. Think of Cloakroom: Live as a firehose of data carefully calibrated by you and filtered by the Cloakroom community to deliver important and relevant information straight to your phone. Long-gone are the days of smoke-filled backrooms in Congress. Despite their merits, congressional ethics rules have eroded the bonds of community on Capitol Hill. Pile on the demands of the endless campaign season, and Members of Congress barely spend three days a week legislating. It’s no wonder our policymakers are incapable of reaching a bargain on anything; some don’t even know each others’ names. Nevertheless, one important social tradition is still alive and kicking in DC: the informational interview. An informational interview is a face-to-face meeting with someone whose career or work you want to learn more about. 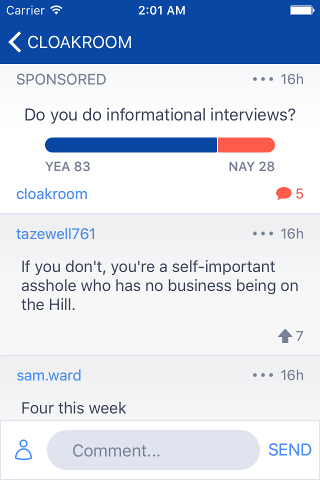 In a recent Cloakroom poll of congressional staffers, 75% said they currently participate in informational interviews. Brad Traverse joins us for a Cloakroom Q&A, Friday June 17th at 3:00pm EST. In order to help Cloakroomers prep for his visit, Mr. Traverse, wrote us a brief primer on his career path to becoming the King of Hill jobs. Hi, I’m Brad Traverse, President of the Brad Traverse Group, the most comprehensive resource for anyone seeking a job on and off the Hill in the fields of government relations, public policy and affairs, PR, communications, and political campaigns. I’d like to talk today about getting a policy or PR job on or off the Hill: the importance of networking, resume review and social media assessment. The Capitol Bells team and I launched Cloakroom in 2015 with the ambitious goal of creating a community of policymakers dedicated to collaboration and consensus building over partisan brinksmanship. It was an idea I personally felt strongly about. As a former staffer, I couldn’t help noticing the divisions among staff from party line to committee — for all their shared experiences, they weren’t talking to one another. This wasn’t always the case: Once upon a time, Democrats and Republicans socialized and shared camaraderie when passing in the halls or working side-by-side. This led to more grand bargains, better legislation, regular order, and a Congress that WORKED. Since Cloakroom’s inception, over 6,500 verified Congressional insiders have flocked to our social network, forming an active community of content creators and legislative debaters. We have hosted bipartisan Q&A's with some of the nation's leading policy and political professionals, like Grover Norquist of Americans for Tax Reform, Emily Bazelon of the New York Times Magazine, David Wessel of the Brookings Institution, Kevin Kosar of the R Street Institute, and even Bill Nye the Science Guy. Everyday our users are going head-to-head with each other and experts on issues no matter how controversial. Because of Cloakroom’s success fostering discourse and acting as a sounding board for Congressional staff, we have decided to expand. Cloakroom will now be open to everyone working at the 100 most influential groups in politics, such as top think tanks, lobbying firms, media and PR companies, advocacy groups, and campaign organizations. Check out the full list of new members here. We want to give more verified political insiders the ability to speak openly and freely, break down partisan blockades, and get work done. Cloakroom users can be as anonymous as they want to be. They get full control over their own data, the right not to be tracked, and full end-to-end encrypted chat to keep private conversations private -- even on heavily monitored government networks. Opening Cloakroom’s doors to more insiders does not mean we are stripping our lively Capitol Hill community of their own exclusivity. Cloakroom is now organized into public channels shared by everyone on the app and private channels accessible only to specific groups, like Congress. However, we expect our current users will value the influx of new professionals on the network. For instance, the "Careers" channel will receive a fresh infusion of seasoned veterans offering advice to political newbies and hot job leads. Connecting Capitol Hill to the rest of the political economy has the potential to harness the power of technology in politics like never before. Cloakroom includes tools that allow policy experts to share their positions on bills to virtually lobby their colleagues, generate big data about the best and worst policy proposals, and bring the secret discussions of back room deals to light. Are you ready to bring politics into the 21st century? Download Cloakroom today! After an 11-day shadowban by the House of Representatives, Members of Congress and their staff are now free to use Capitol Bells and Cloakroom on the House network again. Based on Google’s corrective actions of removing suspicious applications from appspot.com, InfoSec has unblocked access to appspot.com on the House Network. If you have any questions, please contact the CAO Technology Service Desk at 5-6002 or 1-800-HIR-USER.